You may have heard through the grapevine of the interwebs yesterday that we released an iPhone application called "Is This Art?". Within minutes of going public on Twitter, and with the help of some awesome people like MoMA, the Walker Art Center, the Warhol, David Carr and Paddy Johnson among a tidal wave of others, it was easy to tell that people were excited about it. For the general scoop, check out this piece by WNYC Culture or this post by our collaborator on this project, C-Monster. But what I'd like to do here, is discuss in deeper detail the why behind this project. As a museum of contemporary installation art with an artist residency program that exhibits mostly new site-specific works, the Mattress Factory has earned a reputation for pushing artistic boundaries by allowing the artists we work with to explore complete artistic freedom during their time here at the museum. Our goal as an organization is to make the artists' vision a reality. Period. And with that comes artwork that provokes thought and poses questions. Damien Hirst grew flies in our gallery for several months. Yumi Kori flooded our basement with water. Sarah Oppenheimer cut a large hole through our 4th floor gallery floor. If I had a nickel for every time I've heard someone say, "This is art? My kid could do that," I'd be a rich guy. But if I also had a nickel for every time someone has said that our James Turrell pieces have influenced the way they perceive the world or how Greer Lankton's It's all about ME, Not You has brought them to tears, I'd also have some pretty heavy pockets. And back in November an exchange on Twitter with Nina Simon got us thinking about how we, as a small art space in Pittsburgh, could start a wider dialog about the concept of art itself. So shortly after Nina's tweet, I started chatting with Carolina Miranda (a.k.a. C-Monster) about the idea of an "Is This Art?" iPhone app. We knew if this project was going to be effective it would have to be funny, and Carolina is one of the wittiest, most on-point art & culture bloggers out there. When she agreed to write the art crit for the app, we knew we were onto something. All that was left was to develop the app, but again, as a small art space in Pittsburgh, we have no software developers on staff. Enter Deeplocal. I can't say enough about these guys and gals. We've worked with them in the past on some things and our organizations have a similar worldview about art & technology. I truly believe Deeplocal is a special kind of company. They just make things happen. From my initial text message to David Evans pitching the project they were 100% up for it. The rest is history. We hope you enjoy the app and the website, but more than that, we hope this project gets people talking about art -- what art is, what art can be, how art influences people and why art is important. As always, if you have questions or comments, feel free to hit up the comments below or track me down on Twitter. It's been extremely hard keeping quiet about this the past few days, but the time has come and I'm really excited to share this tidbit of information with you. As you know, each year in June the Mattress Factory hosts our biggest and most important annual fundraiser, the Urban Garden Party. Every year becomes bigger and more over-the-top than the previous party, and 2010 is no different. This year marks the first time we've booked a headlining musical performer. 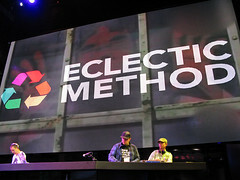 Ladies and gentlemen, I give you Eclectic Method. Featuring London natives Jonny Wilson, Ian Edgar and Geoff Gamlen, Eclectic Method helped pioneer the emerging art of audio-visual mixing since first cutting U2’s Mysterious Ways music video with the Beastie Boys’ Intergalactic as an experiment back in 2002. The trio’s audio-visual mash-ups feature television, film, music and video game footage sliced and diced into blistering, post-modern dance floor events. It’s a cyclone of music and images mashed together in a world where Kill Bill fight scenes and Dave Chappelle’s Rick James rants are ingeniously cut and looped over bootleg samples, DVD scratches and pumped-up dance anthems. The trio was also recently featured in the documentary, Copyright Criminals. SUMMER IN THE CITY: The 2010 Urban Garden Party will take place on Friday, June 18th. We're extremely fortunate to have an amazing Event Chair this year in Christine Astorino, a Mattress Factory Board Member and Founder & CEO of fathom. Tickets to the Urban Garden Party are now on sale! Through March 1, you can get two tickets for only $140 (a savings of $40). And the best part? 100% of your ticket purchase goes back into the artistic programming here at the museum to help us continue to push artistic boundaries and produce cutting-edge exhibitions. Thanks in advance for your continued support. As the Director of Education here at the Mattress Factory, I spend a lot of time thinking about how our programs can engage people of all ages and shape the way they experience art. For those of you who have visited, you know that the space itself serves as an amazing educational laboratory. But we don't just provide opportunities to learn more about our artists and exhibitions. I think the Mattress Factory is an incubator for learning itself. A recent op-ed in The New York Times called "Playing to Learn" got me thinking about this point. Author Susan Engel (a psychology professor at Williams College) suggests we should seriously consider a complete overhaul to the standard public school curriculum. She argues that the traditional curriculum is counter-intuitive to the ways in which children actually learn, which is by experience. Instead of cramming facts and figures, Engel believes children should "develop ways of thinking that will lead to valuable knowledge and skills later on." Engel doesn't explicitly mention the value of art in her article, but she does talk about how play can satisfy a child's curiosity about things that interest them. I couldn't agree more, and I feel the same way about art. Installation art can help children learn about the world around them. It can also allow them to develop their own ways of thinking about the issues addressed by the art. The Mattress Factory is like one big experiential learning environment - one that is filled with art and opportunities to stretch one's brain in new and interesting ways. Do you think about the world differently after a trip here? Feel free to let us know by leaving your thoughts in the comments section below. Due to inclement weather, and the declaration of an emergency by Allegheny County, the Mattress Factory will be CLOSED on Tuesday, February 9, 2010 and Wednesday, February 10, 2010. Please check back here or follow our Twitter stream for the latest museum closing news. 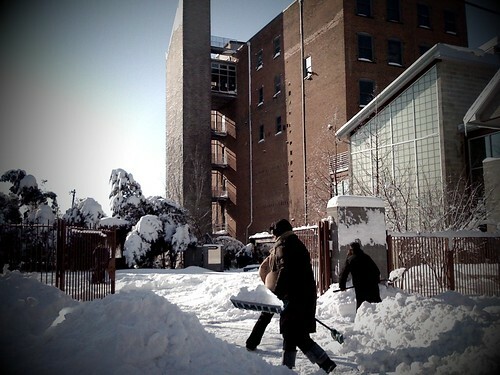 Mattress Factory staff dig out after the storm. 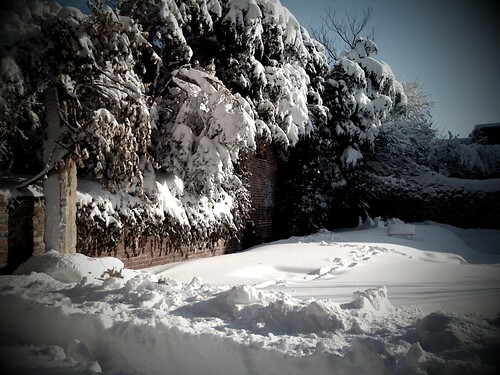 The Winifred Lutz Garden under two feet of snow.